Since I’ve started traveling and living abroad, I’ve developed a growing appreciation for foreign words in English text. While I enjoy the occasional italicized vocabulary, I love reading sentences and dialogue in a foreign language, even one that I don’t understand. Scott Fitzgerald and Ernest Hemingway practiced this regularly in their work. Both lived and worked abroad, and both had relationships with foreign women, making it easy for them to learn the language and incorporate it into their work. They wrote street names, food and drinks, and greetings in their original language, and they also incorporated full sentences and dialogue in French and Spanish. This gave their work a very authentic feeling, and an unapologetic, personalized touch. Both the reader and the protagonist are challenged not to translate the conversation, but to understand the mood of the characters in their own language. Fitzgerald does a good job explaining his foreign texts with a relevant English response, as in the example above, or by describing one of the characters reactions to the dialogue. Much as it takes a creative reader to understand the context, it also takes a diligent writer to make himself understood, even in a foreign language. Some readers and writers dislike seeing untranslated text in English work. They feel that the author is condescending them, or that he is indifferent towards his readers inability to speak the languages he speaks. I don’t believe this is the case; I believe the author understands that his readers are intelligent, thinking people. He respects their decision to either translate the work themselves or to consider the foreign text a foreign matter that develops the characters and plot in a subtle way. Unfortunately, this practice is slowly disappearing in literature today. Foreign words still appear in novels, but they are either italicized or directly translated in the next sentence. The reader isn’t given the chance to try and translate the words themselves through context. I read an English book recently that was set in France, and in the first chapter, the author used only one French word: décoration. In this case, neither the reader nor the writer was challenged, and neither learns much about France or the French language. This desire to be comfortable instead of challenged is also seen in the real world: all airports, tourist areas, and even city centers have English translations underneath native text. This is convenient for travelers passing through, but often annoying for foreigners who enjoy thinking creatively or want to learn the language. The joy of the unknown is gone. Much as travelers go to foreign lands to experience new things, readers use books to learn about something completely new to them. 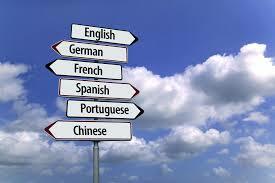 Some argue that untranslated foreign text hinders this ability to learn new words. However, if a reader is diligent and creative, they can use the foreign text, and even J.R.R. Tolkien’s make believe languages spoken in the Middle Earth, to interpret emotion, character traits, and progression in plot. Kristyn Bacon is the founder and editor of Trainless Magazine as well as a freelance writer. Her stories have been published by literary journals such as MOOKYCHICK and DEW ON THE KUDZU and are included in anthologies byBOOKIMBO and SWYERS PUBLISHING. Her sports writing has been published by INSIDE DIRT and DAN HOLLOWAY, EIGHT CUTS. An architect read her work and compared it to George Saunders.